In the Grumman years one person worked, one stayed at home and they enjoyed a solid middle class life with reasonable taxes and a reasonable commute. Contrast that with today where to get the same financial QOL two jobs are required or having one spouse commute to NYC with all the accompanying stresses that go with juggling work and kids. I do agree it's unsustainable - but as long as people keep on absorbing these things it'll keep motoring along. The thing I agree with and am concerned with is the dependency of LI on NYC. If NYC sneezes LI catches the cold. The first thing that’s going to happen once it becomes clear it’s unsustainable, is asking the unions for concessions. I’m sure that’ll go over like a lead weight here. It’s happening now state wide in CT, the state cannot sustain the commitments it has made over the last 30 years. It’s seems to me, Nassau is not far behind from this. Grumman? Long Island got over that 30++++++ years ago! I’ve been hearing about LI being “unsustainable “ now for 20+ years. People Come & Go, just like any other state/county. We ALL COMPLAIN and most (noticed I said “most”) of us still stay. Post after post, forum after forum it’s the same issues that we’ve been dealing with for decades. Those living in upper class & richer areas, their not concerned about the SALT tax. Pennies on a dollar to them. Nassau’s population been SLIGHTLY increasing over the years. I never saw so much traffic in my life! Last edited by Spanky25; 05-01-2018 at 06:52 PM..
As point out before, Nassau’s population is still lower than 1970. So a list dominated by manufacturing and banks. A big transition to retail and higher ed. This is for the whole state, I’m sure LI mirrors this. When you lose $80K engineering and manufacturing jobs that provide a pension and replace them with $40K retail jobs that don’t pay benefits it’s not the right direction. LI residents who leave are being replaced with NYC residents and IMO, this cycle will continue. It’s more afordable to live in LI. And relatively so, but the point is that more and more jobs don’t require living in NYC or on LI. I know many who have moved to points south and west, transferring with the same company. I don’t think there will be any big crash, just a continual and gradual downslide. It may take another 50 years but a reckoning is coming. “When you lose $80K engineering and manufacturing jobs that provide a pension and replace them with $40K retail jobs that don’t pay benefits it’s not the right direction. Engineering jobs were gone in the 80’s. It’s now 2018. So, then who is affording these ridiculous taxes & housing prices that are on the rise? Who is affording these 1 BR apartment complexes for $2,500+ $3,000 + for 2 BR that are popping up all over LI? It’s not the landscapers. You’re thinking of manufacturing engineering. Many left with Grumman but there are still small manufacturers serving the military. I know some of these owners and it’s getting harder to get skilled labor now. Some are contemplating moving south too. Companies like CA hired a ton of software engineers in the 80’s and 90’s, many based on LI. Where are they now? Largely India. 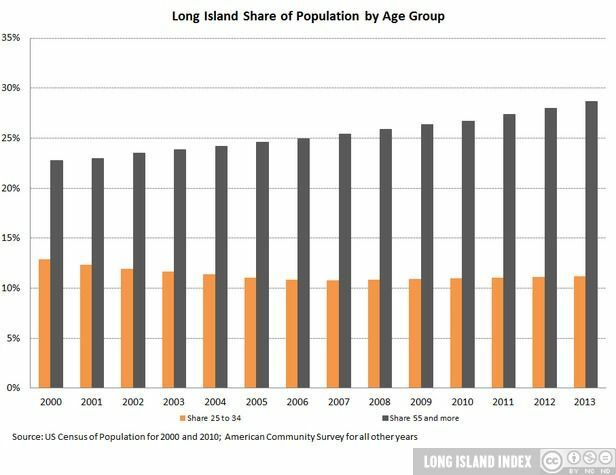 The LI population is aging, so older people are taking on more of the taxes. “So, then who is affording these ridiculous taxes & housing prices that are on the rise? Again, I greatly appreciate your opinion.